Are Website Landing Pages Just for Ads? If you’re a frequent visitor of our blog, you know we have a few areas of interest we tend to focus on—social media marketing and responsive websites are two examples. Landing pages are on that list too, and not only because we enjoy making them. Our enthusiasm is based in large part on the importance of these informative virtual storefronts. Landing pages work like information kiosks for people popping over to your site after searching for a keyword phrase or clicking on a Google ad. More than simply a gateway to more information, landing pages actually serve you and your practice in three major capacities. One, of course, is advertising. The other two, though, offer benefits just as great. The most well-known purpose of landing pages is to serve as the opportunity to convert a click on an ad into a new patient. CRO, or conversion rate optimization, is the process of identifying the best way to coax the largest percentage of visitors to your site into completing an action, in this case scheduling a consultation. An informative, relevant, and high-quality landing page can be an excellent way to increase your CRO. When style, information, and AdWords work together, you and your patients both prosper. Landing pages can also work like business cards for doctors: they present a digestible amount of information while giving an overall impression of who you are, what you do, and what you value—a mini consultation, if you will. The pages express your intelligence, your commitment to care, and your dedication to leading techniques. So, put your best face forward. 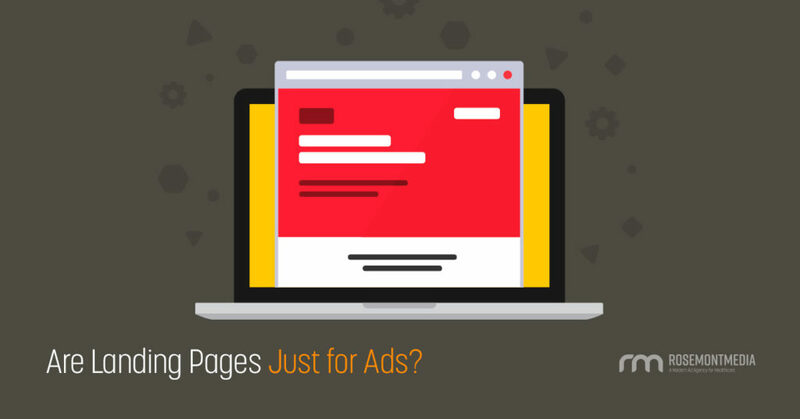 Landing pages are more than an ad conversion tool or window design on your website. They have essential, multifaceted purposes that lead prospective patients to choose you over someone else, which is why you should give them the attention they deserve. We can help. Talk to our team about custom landing pages to make your website really pop, or learn how we craft every piece of content and refine every image to evoke your practice philosophy and exude professionalism. Have questions? We have answers. Contact Rosemont Media online or give us a call today to find out more.